Missler Software - CENTERSOFT s.r.o. Missler Software is the world's leading publisher of CAD/CAM software. With more than 30 years of experience under its belt, Missler Software is in a position to offer a fully integrated CAD/CAM solution. The company mainly targets the mechanical sector (machinery, tools, etc. ), sheet metal work and the wood industry. Wherever a machine interacts with material to machine, shape or produce a part. The TopSolid product range is fresh, comprehensive and unique on the market. Thanks to its advanced technology and its permanent sense of innovation to the benefit of its customers, Missler Software has grown strongly on the global CAD/CAM market. 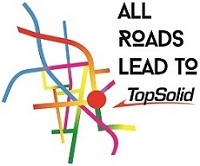 Today, more than 10,000 companies all over the world use TopSolid. The company has expanded significantly on the international stage in the last decade. Paris, Lyon, Toulouse, Nantes, Nancy, but also Chicago, Shanghai, Bogota, Delémont and Modena. Today, our products are shipped all over the world and more than 70% of our software is exported. Missler Software has partners in Europe, Asia, Oceania, Africa and North and South America. More than 500 employees (Missler software employees and resellers) develop and sell TopSolid all over the world every day. Much to the delight of designers and machine operators.